SIX FERRIES LATER .... | Roda Forum Online - Information at your fingertips! 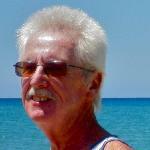 We left Corfu in September on our annual autumn trip to the UK & back, to see family & friends. We thought we were better prepared this year, but all the last minute stuff tired us out a bit. We were pleased this time to find a campsite nearer to the ferry port in Ancona, especially as we were arriving later in the day. I had stayed at Mar y Sierra in Mondolfo many years ago, but it’s in new hands now and it closes through the winter. We just managed to get in during their last week. Le Marche is not the most famous region of Italy, but it has such delightful countryside if ever you find the time to explore it. Our terraced campsite overlooked a very picturesque little valley with the town of San Costanzo perched on one of the hills and the Adriatic off to the east near to Senigalia. After that, we awarded ourselves a three-day stopover near to Ravenna, where we managed to get a few swims in the sea and in the campsite pool. The sun shone, and it was all very relaxing …. just what we needed. 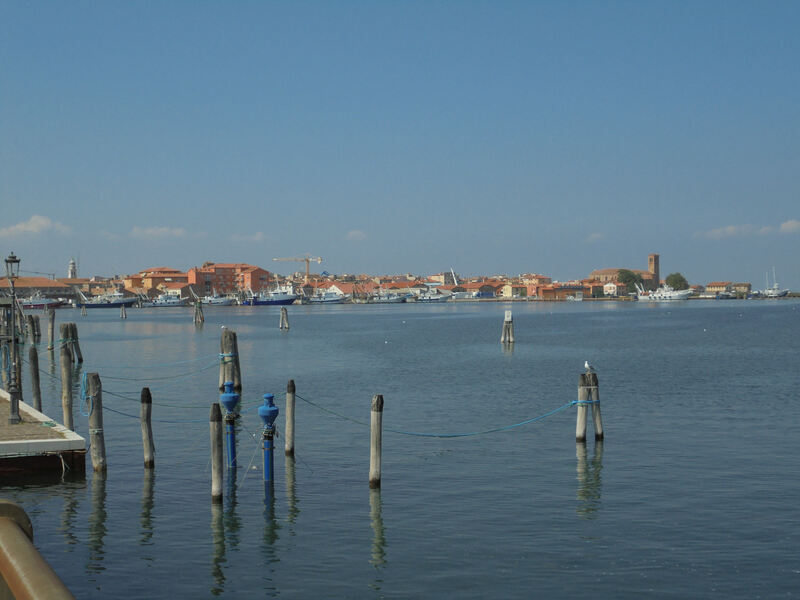 For two years, we’ve been trying to get to Chioggia at the southern end of the Venetian lagoon, and just north of the spectacular Po delta. The campsites at Sottomarina close quite early, but we managed to sneak in just in time. 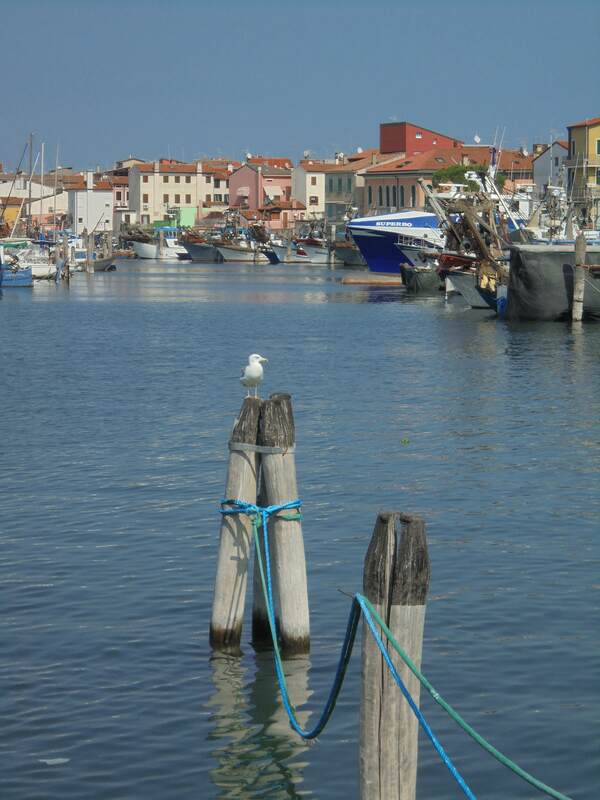 It’s a 2km walk into Chioggia, but it was well worth it. This ‘mini-Venice’ has just three main canals and it’s easy to walk around and much less commercialised … we thoroughly enjoyed it. The small town boasts the oldest clock in the world, standing peacefully in the centre of the main street …. September is definitely the month to pay a visit. Some pictures to give a flavour of our trip. 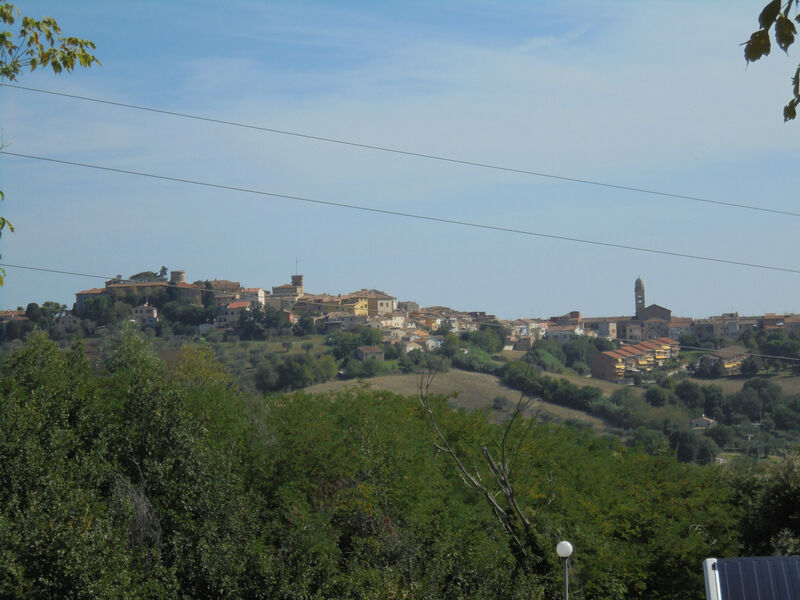 The first one is of San Costanzo on the opposite hill to our campsite, you can only see one church but we could hear at least four chiming the hours all at slightly different times. 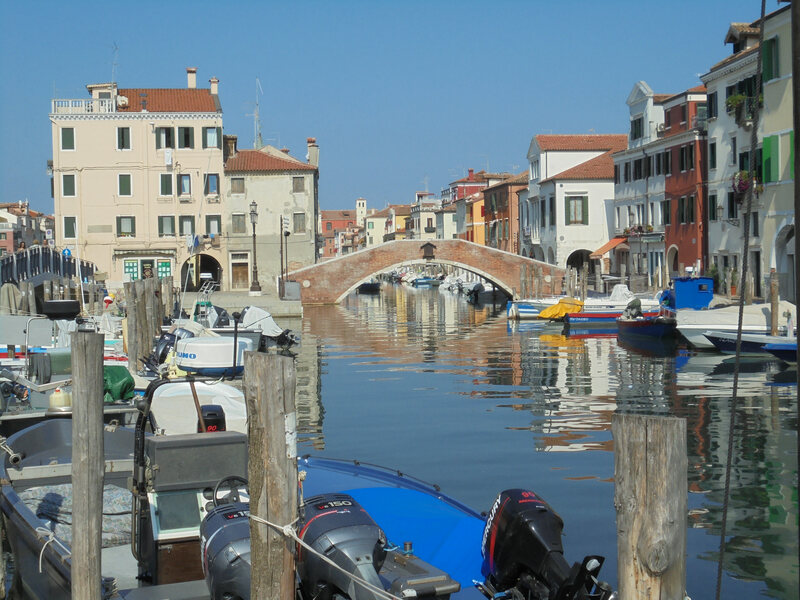 The rest are of Chioggia showing the clock tower, the working fishing boats and general canal views, finishing with a view down the decorated covered arcades that we have found in all the Italian towns we visited. 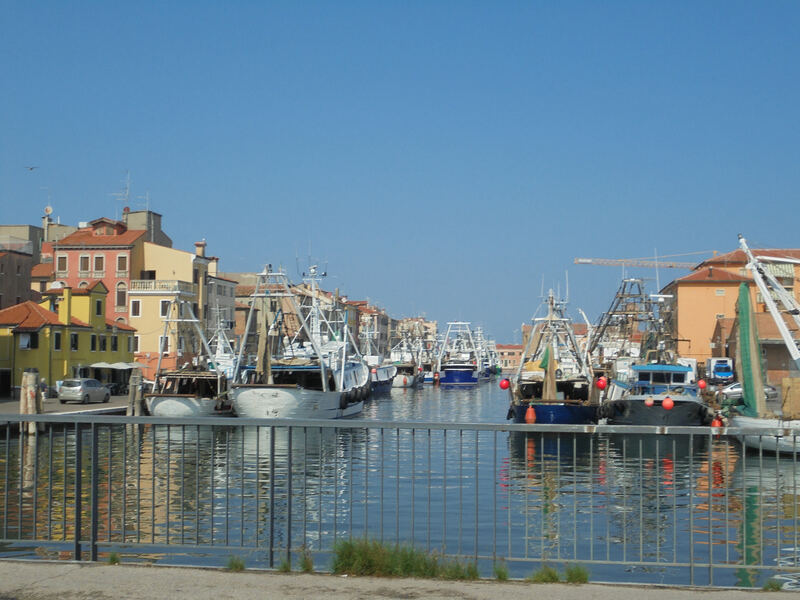 Both were so pretty, San Costanzo and the rolling hills of Marche and the delightful canals of Chioggia. If and when we ever get round to it, what route would you suggest? Hi Wendy - have had a couple of busy days ... I'll answer your question tomorrow. I have known people who travelled by car to Roda for many years - they spent sixteen days in total, spending ten days in the village. With a motorhome, you would need a bit longer and it would be a shame to pass all those lovely places without stopping at one or two on the way. Our policy has evolved into choosing a couple of places we really want to see and spending two nights there. The first day gets us to our destination, and the second day we spend sightseeing. It's best to use campsites within easy reach of the town - some you can walk to, or we have even used local trains (e.g. Antibes & Nice), busses (e.g Verona & Innsbruck) and ferries (as in Portofino). Have a look online at ACSI - a Dutch organisation that gives great out-of-season discounts for an annual fee. The quickest we care to do the journey from Calais is around 8/9 days ... our journey back this time was ten days, but that gave us three rest days in Riquewihr, Innsbruck & Garda. On average, we drove about 200 miles each day. Sometimes, we have a short day's drive, arriving at our campsite around lunchtime, and walking in to a local town or beauty spot in the warm afternoon sun. We did that this time at Eguisheim and at Lake Constance. There are several routes from the UK and, although we stick to the main plan, we vary our stopovers to see as many places as possible. There is one route we haven't tried yet, and that is from Turin, through the Mt Blanc Tunnel to Geneva ... maybe one day. For us, it makes more sense to buy the annual Swiss Vignette (just under €40), which gives access to almost all the routes except the Mt Blanc, which is extra. The same goes for the Frejus Tunnel which takes you straight from Italy to France ... the tunnel fee costs more one way than the Swiss vignette which gives you a year's motoring. Austria also issues a vignette at around €10, but that only lets you drive there for a week. Many French roads carry tolls, of course, but we have a SANEF tag which you can buy online in the UK and takes a lot of hassle out of stopping at toll booths. 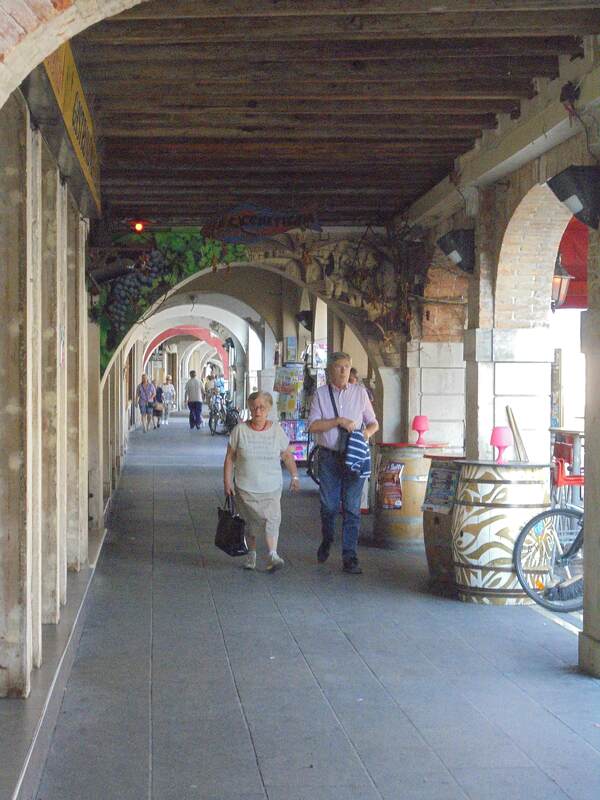 One couple who used to live in Roda, would always travel from Munich to Villach, and then down through Udine to Venice. Heading back, we would go to Milan from Ancona, and then cross from Lake Lugano, through the St Gottard tunnel to Basle. From there, we usually head through Alsace into Luxembourg before swinging west to Brussels and Dunkirk. You could also miss Brussels by heading to Lille and then to the ferries. We've started heading into southern Germany recently, or back through Basle towards Zurich to Lake Constance (Bodensee). From there, you're straight into Austria (cheaper than Switzerland!) and we stay over in Innsbruck. After that, it due south through the Brenner Pass (another €10) and through Sud-Tirol to Lake Garda. You could drive from there to Ancona, but the ferry times mean we need another stopover on the way. There aren't too many campsites in central northern Italy, but you could head for Bologna or Rimini. From either one, the port is a straightforward drive the next day. Apart from Luxembourg, fuel is pretty much a standard price all over Europe these days. The distance from Roda to Dunkirk or Calais is between 900 & 1100 road miles, depending on your choice of route. Any questions as far as I've gone? 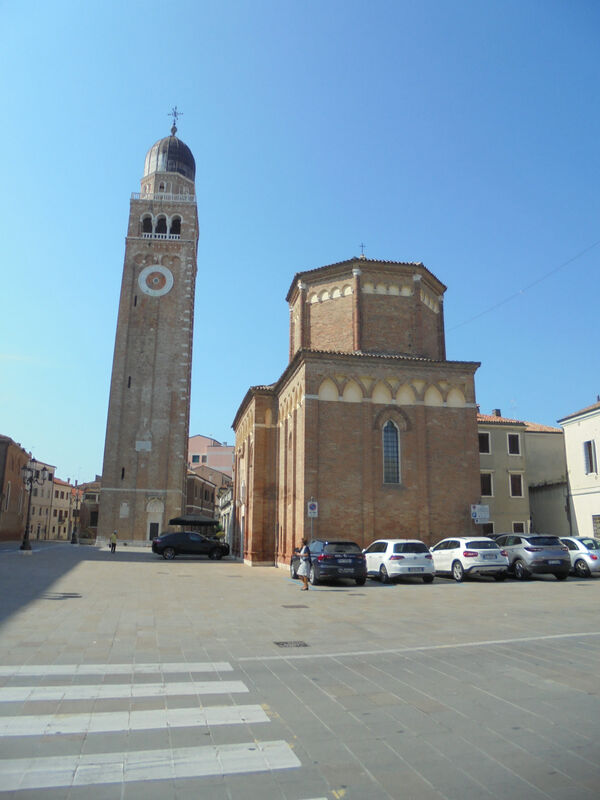 Having spent an enjoyable day in Chioggia, we headed off early for a long-ish drive along one of Italy’s busiest autostradas that runs from Venice to Milan. Once you get through places like Soave and around Milan, the route veers off to the north for Switzerland. 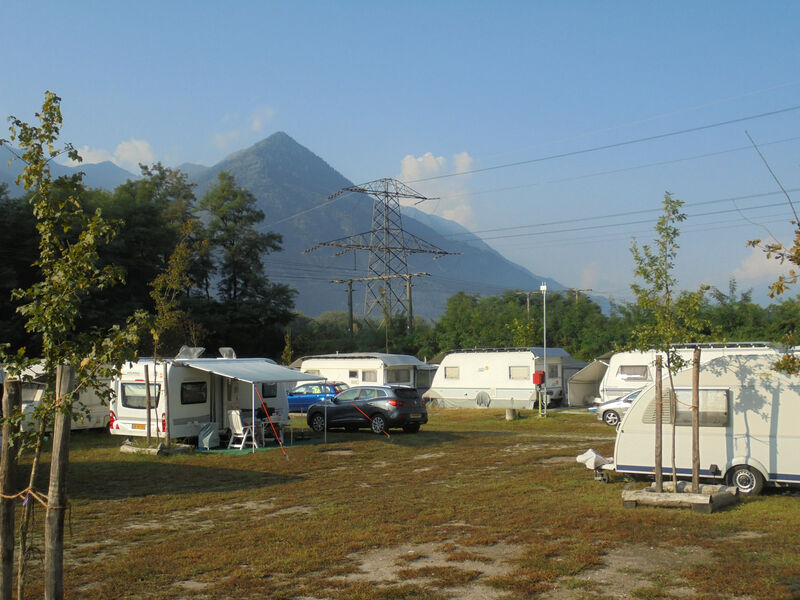 We’ve always tried to stop just outside of Switzerland on Lake Lugano, as the campsites are cheaper …. but this year, with the aid of our ACSI membership, we located a site near Bellinzona that was offering reduced rates. Camping Riarena at Cugnasco sits in the amazingly fertile Magadino valley, part of the Ticino river flood plane and running into Lake Maggiore near to Locarno. When one considers the sheer heights of the mountains that surround it, up to almost 2,000 metres, it’s all very dramatic… there’s even a proper airport there! It’s a great place for walking, and there is public transport that can get you to several places along the valley and down to Locarno itself - maybe next time! We were quickly back on to the motorway the next morning, heading for Lucerne and Basle along what is now becoming a familiar route. Basle is a big important town, sitting on the Rhine and being at the junction of three countries - Switzerland, France & Germany. I first lumbered into Basle on a train in the middle of the night while the border police walked the length of the train to check us all out … I was just fifteen and on my first school trip all the way to Vienna. 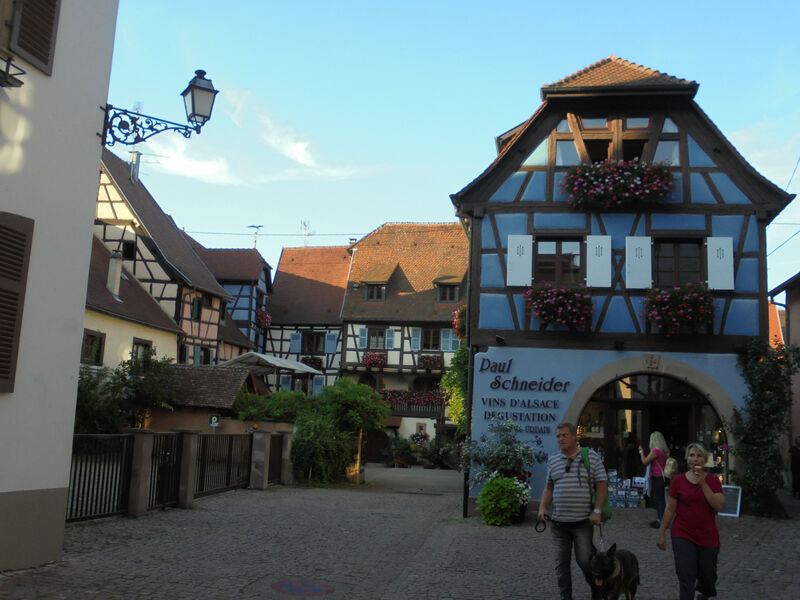 This time, we were through the town in record time, heading for another favourite destination these days - Alsace in north-east France. 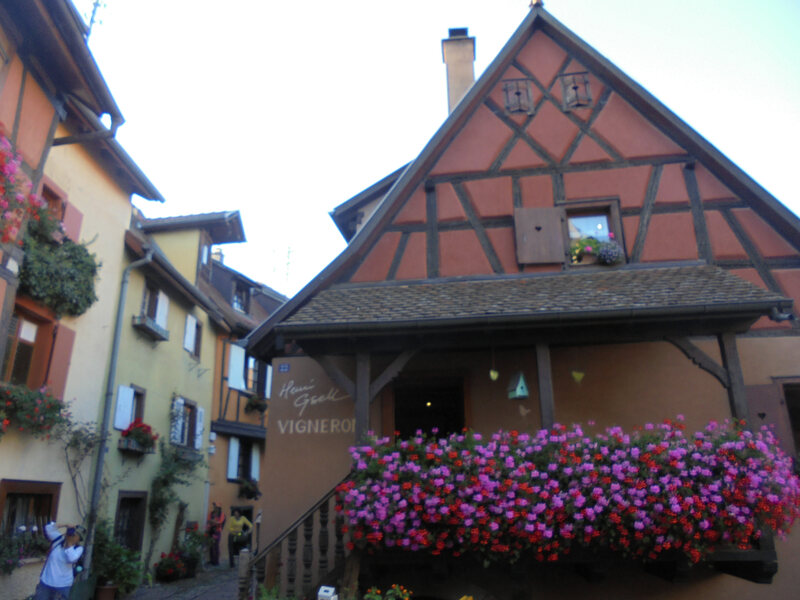 In the foothills of the Vosges mountains, the campsite at Eguisheim is very convenient for the tiny town … we’ve reviewed it before, but it really is a magical place. With vineyards running down into the town from every direction, September is the best time to visit, if only for the smell of fermentation that hangs in the air. It is the perfect place for a one-day visit as it’s half-timbered houses form a tight circle around the tiny centre, with many producers in evidence making such famous wines as Silvaner, Reisling & Gewurtztraminer. On our return journey this time, this was the only small corner of France that we visited as we continued our way north. 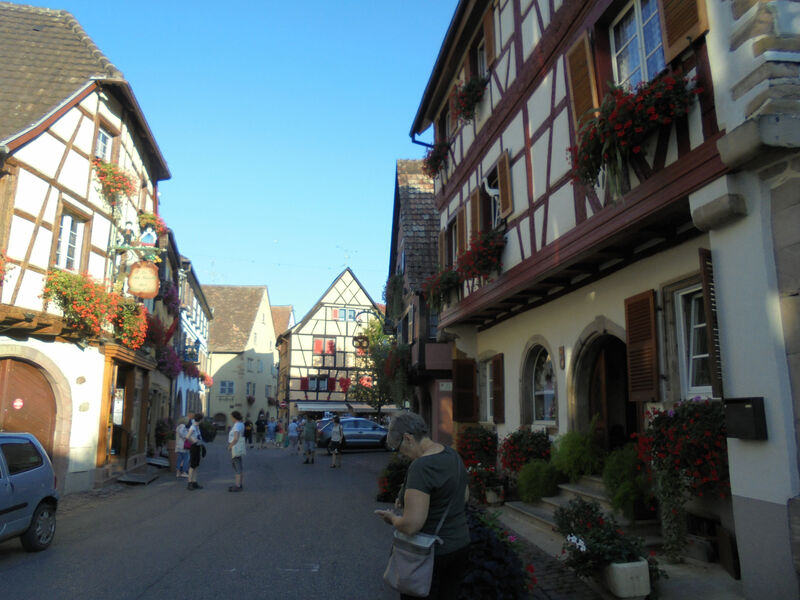 Here is a photo I took from the campsite in Switzerland and then the lovely half-timbered houses that is Eguisheim. We have been there several times now and it is always delightful. We always look for storks on their nests but haven't seen that so far, however more on that later. From the Colmar area of Alsace, we always find it better to head north to Strasbourg and then across to Metz. This avoids the slow, but picturesque crossing of the Vosges Mountains, as our drive to Luxembourg is one of our longer stages. We usually award ourselves a day off in Heiderscheid, as the campsite is not expensive, it’s open all year, it has a heated indoor swimming pool and the countryside is beautiful. The site is quite a little community, with a camper shop, a take-away, a small supermarket with a restaurant area, and a filling station … everything we need for a relaxing day. From there, it’s a short hop into Belgium at Bastogne, an important town in WWII’s Battle of the Bulge, an on towards Namur to join the motorway again. Belgium is a heavily wooded country, and the journey to Brussels is through rolling hills and forests. Brussels can be a bit slow, traffic-wise, and we always seem to slow down near to the airport. After that, it’s a straightforward run to Ghent and Bruges, where we often stay on one of two different campsites. This year, we went a little further to a site we’d not used before at Nieuwpoort, site of the 1914 Battle of Yser. This large campsite is almost right on the North Sea and just far enough away from Dunkirk to get the engine nicely warm the next morning. Our two-hour crossing to Dover the next day was forecast to be very stormy, but it was not as bad as we feared and everything ran to time. And so to Kent, where we stayed for the first time at Painters Farm near Faversham, just a stone’s throw from the famous Brogdale Farm, home to over 4,000 varieties of fruit. If you’ve never been, you really should try to get there some time. Here we are in Kent, with the beautiful Kentish farmhouse that our caravan site belonged to, the orchard next door dripping with ripe apple and the Brogdale fruit collection. 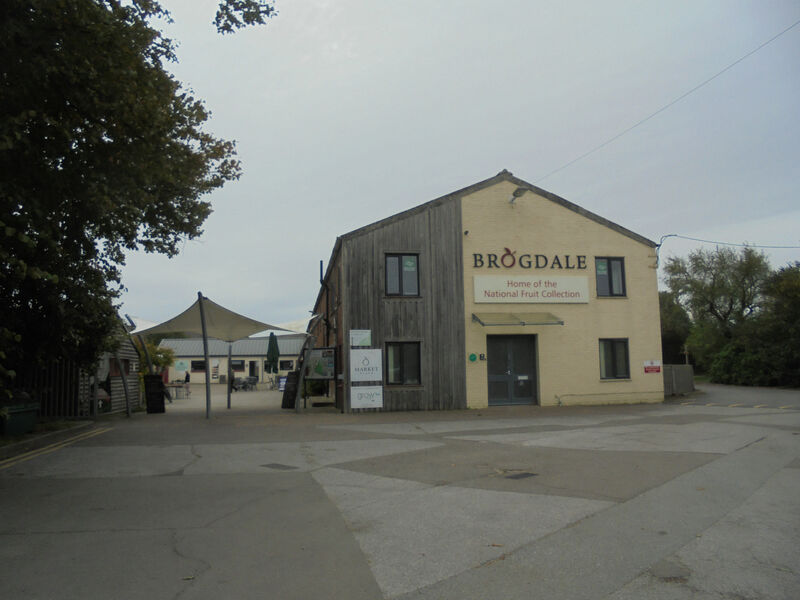 Brogdale is an interesting place to visit as it is very informative about British fruit, but there is also a lovely cafe, and excellent butchers, a garden centre selling fruit trees, of course, and other interesting little shops. When I lived in Faversham many years ago, the village of Painters Forstal always intrigued me but I’d never been there. When we found out recently there was a small campsite there, I simply couldn’t resist. In the middle of what is left of our superb apple orchards, Painters Farm was the perfect choice. 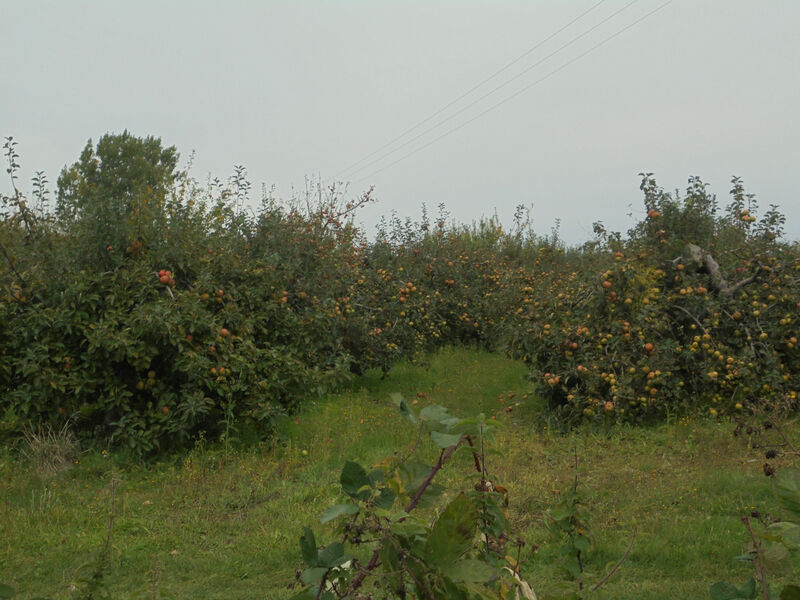 It was good to visit Faversham again, but it’s criminal to see just how many of the orchards have been grubbed up because we no longer buy English apples, except those deemed by the supermarkets to have greater ‘continuity of supply’, and to suit their margins! One wonders where we, the consumers, fit into this equation and, returning after many years, the effects of their influence can be clearly seen as orchards give way to house building. Painters Farm campsite is very peaceful, being set amongst mature cherry trees a good distance from any major roads, and it was good to have a pint of 'Master Brew' in the local pub, the beer having travelled about a mile from where it is brewed by Britain’s oldest independent brewer. 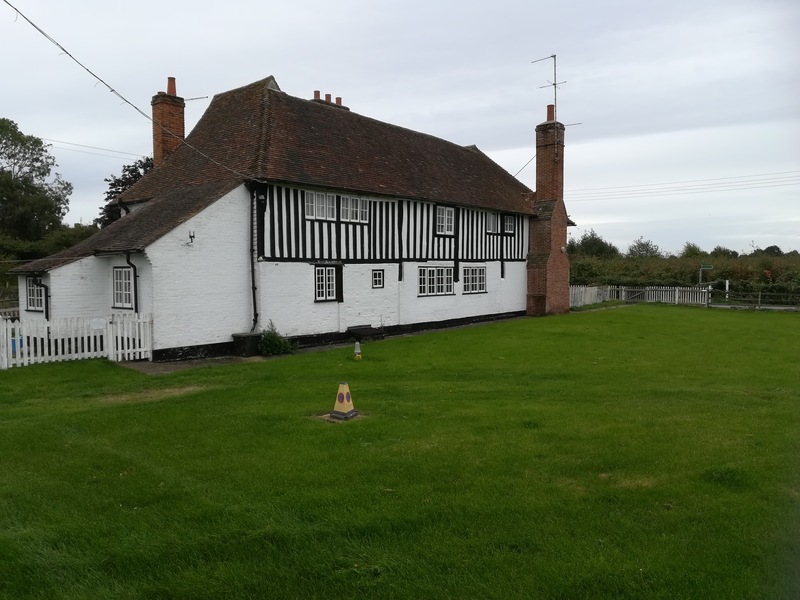 Our plans to stop next in Lincolnshire had to be changed, so we pressed on a little further north to the historic town of Tuxford in Nottinghamshire. We had discovered an all-year campsite which maintained the orchard theme, being set amongst mature fruit trees and just a couple of minutes from the A1. The area is steeped in history and, maybe next time, we’ll use Orchard Park campsite as a base to find out more, especially as it is associated with ACSI which gives us cheaper, out-of-season fees. Our homeward journey was coming to an end as, from here on, we stayed with relatives in Durham & Edinburgh before heading home to start all over again. It wasn’t long before Jan & I were heading back south again, off to see our families in Wales, north & south. We couldn’t wait to get to Clay's campsite in Wrexham, because we remembered the sloes we found last year at the same time. It was great anticipation that we headed off down the quiet lanes collecting in search of sloes, wild damsons & rose hips - does no one do this any more? Anyhow, with sloe gin infusing nicely in a kilner jar, and a couple of bottles of Glayva whisky for Jon in the Boathouse, our brewery moved south to Cardiff, pausing only for lunch in Craven Arms. When we’re there, we stay almost right on Cardiff Bay and, the day before the half-marathon, we headed into town to the National Museum … what a treat! Unfortunately, our visit to prehistoric Wales & the dinosaurs was cut short by a fire alarm and we had to leave the building - we will certainly go again. A stopover in Berkshire and another night at Painters Farm saw us back in Dover to catch a lunchtime ferry to Dunkirk followed by a short drive east. More of that next time …. Our trip through the UK was marked by two or three stand out events, other than seeing both our families. There was sadness as well with the sudden death of two of my relatives. We did however find things to brighten our days. 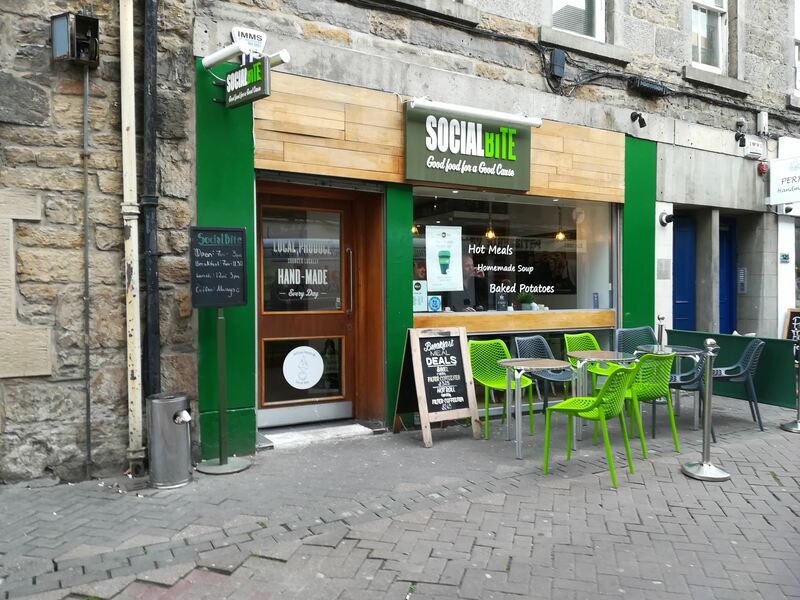 The first was the marvelous Social Bite Cafe in Edinburgh that we stumbled across when looking for a quick breakfast roll and a cup of tea. We were impressed by the choice, the price and the decor then we realised that, very discretely, people were being served without payment. It turned out that you could donate money to cover everything from a simple coffee to a dinner. The donation is written on a post-it and stuck on the back wall. A quarter of the staff had been homeless and/ or had other difficulties. I discovered that they have more cafes in both Edinburgh and Glasgow. We plan to use them in the future. 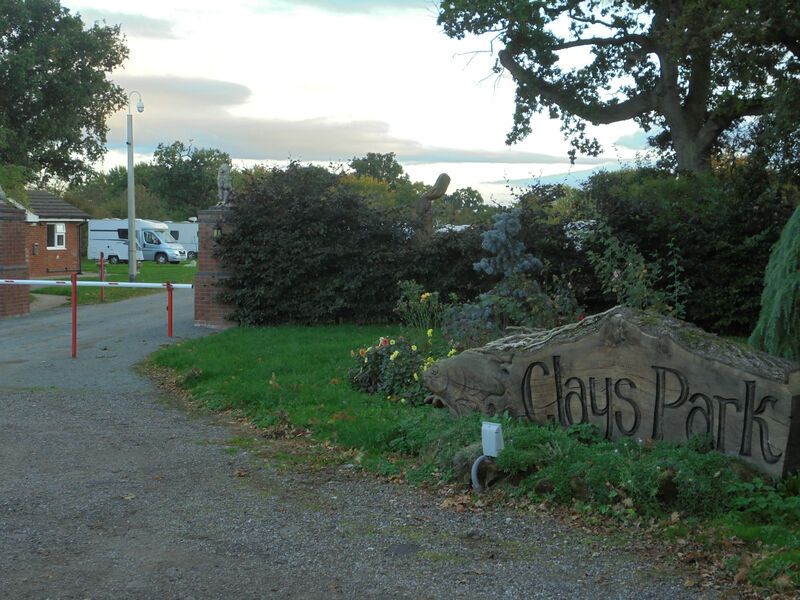 We enjoyed our time at Clays in Wrexham, a pretty site with distinctive carved trees and lots of wildlife. The campsite sign is a carved fish. A 30 minute stroll along the lane resulted in bags of sloes, damsons and blackberries, plus a few rosehips. 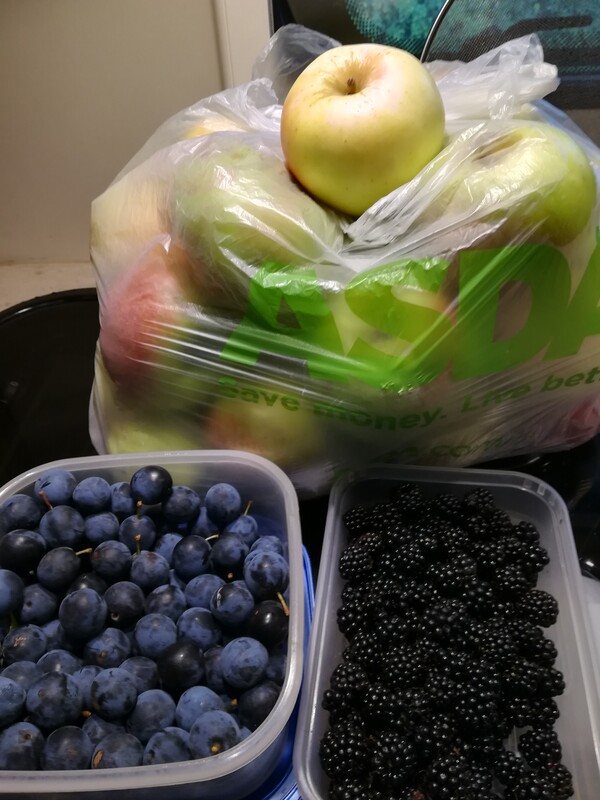 A huge bag of apples from Claire dictated that a blackberry and apple crumble be made. Steve got his damson and sloe gin on the go and the remaining fruit travelled with us on our journey. Cardiff Natural History Museum was very busy but so interesting with many exhibits directly related to Wales or areas not very far away. Thankfully we were near the end when we started to smell smoke and were gently but firmly ushered from the building. There was so much to see we will have to return. We could cross the channel on the train but, for us, the ferry journey is something of a transition - a shift from one world to another. During the two hours that it takes from Dover to Dunkirk, three if you count the time difference, our spirits are lifted and we switch to relaxation mode, ready to enjoy the journey ahead. Keen to get further east as quickly as possible, we stayed only one night before moving south towards Paris and turning east for Châlons-en-Champagne. This is the French ‘capital of circus’, which, in spite of it being much smaller than Reims, is also the capital of the department of Marne. When I first travelled this way it was known as Châlons-sur-Marne, and there were signs for both names - very confusing. Again, a brief overnight stop in peaceful surroundings saw us off to an early start, heading back east again towards the Vosges mountains. This time we headed straight into the mountains via the Col du Bonhomme, at roughly the same height as Mt Pantokrator … the summit of the Col marks the border between the French departments of Lorraine and Alsace and the scenery is magnificent. Just a short way from there, and we were down in the foothills of the famous Alsace wine growing region, with vines as far as the eye could see. Town spires popped up in every fold of the hills, each one putting a name to well known local & international wines. Having seen a canal TV programme featuring Prunella Scales, we headed to Riquewihr, where there is a very popular campsite just a short walk from the town. We spent two nights there which allowed us to examine this treasure in its entirety. Thank God we didn’t go earlier in the year because, even in early October, there were enough tour parties in the streets … not surprising really, as the whole town is a picture postcard. How many more towns are there like this, I wonder?